With the passing of Tony Scott in 2012 still kind of shocking, looking back on his films remains the best tribute for this artist, I think. He shared a brilliance in the medium with his older sibling, Ridley Scott. While both apprenticed via their TV commercial production work, movie viewers definitely knew when the younger brother traipsed across the screen in front of them at almost any turn. Primarily through his distinctive, individual stylings. With his frenetic camera and editing, along with his saturated colors and bombastic action storylines, Tony stood out. From The Hunger, Top Gun, The Last Boy Scout, to True Romance, this was so. Even more with Enemy of the State, Spy Game, Man on Fire, and Domino. Critics blasted him, but over time ate their words. And fans, me included, loved his excesses, no matter. His 2006 film, Déjà Vu, has registered heavily with me since his death. Everything that made a Tony Scott film, a Tony Scott film, was right there. Including the lead performer he made five characteristic films with, Denzel Washington. Scott beating out Spike Lee for most collaborations with the actor. Besides the things that traditionally worked for the filmmaker, Scott’s opening titles sequence for Déjà Vu hit on all cylinders among his many productions, which I’ll attempt to highlight. Setting it in motion, the haunting chords of Harry Gregson-Williams‘ score sink in straightaway as the animated logos splash onscreen moodily. The well-known Touchstone Pictures and Jerry Bruckheimer Films emblems, in fact, along with theme song, roll back mid-stream to begin yet again. Mimicking the story device of the future/past aspect of the sci-fi film. Once we’re introduced to a post-Katrina New Orleans, with all the sights and sounds of celebratory Mardi Gras festivities as a backdrop, the theme adds a brief, evocatively voiced passage as the titles commence their transitions across the screen. In contrast to the reverie, along with the mournful strings, the music foretells the tragedy set to arrive. All while credits bespatter the screen, shift elsewhere, and blink before running off. Their designations framed by a sliding rectangle motif as the terrorist victims move into place within the sequence. Audio/visual and main title designed by Skip Film. Film editing by Jason Hellmann and Chris Lebenzon. Graphically, it’s all meant to foreshadow the trailing 4 day, 6 hour, 3 minute, 45 second, 14.5 nanosecond story paradigm coming with this time-travel thriller. Tony Scott’s custom of an ever-moving camera right in their midst, making the sequence personal in his unique way. The entire key event of the movie laid out as the opening titles is written on the motion picture screen, and strangely reminiscent. With great care, the complete progression builds to its stunning calamity. The whole a setup to Scott’s colorful mayhem reaching its terrible bright glory by the scene’s conclusion. The sequence remains something to behold. A praiseworthy bit of filmmaking by someone, I daresay, we will miss for quite some time. Copyright infringement prevents posting the sequence on YouTube, so the slideshow will have to do. I want to look at the title but I’ve not seen the film and I want to experience it whole before looking at the parts. Tony Scott was a distinctive eye behind the camera and his films are reflective of that eye. The Pelham 123 remake was fine for what it was, but “Man on Fire” is a fantastic piece of manipulative brutality that I like to subject myself to because the revenge theme just works. “Unstopable” was a solid film and it had that camera perspective that you refer to. I understand completely, Richard. Last week I teed up ‘Unstoppable’ once more. It’s a crowd-pleaser. Great point for the solid ‘Taking of Pelham 123’. “…“Man on Fire” is a fantastic piece of manipulative brutality that I like to subject myself to because the revenge theme just works. How very true! A remake that really surpasses the 1987 original. Gotta screen that one once more, and soon. You might want to postpone reading my upcoming music/movie post set for Friday till after you’ve watched Deju Vu. Don’t want to spoil anything 😉 Thanks, Richard. You’re talking about one of my favorite ‘dark horse’ directors. Scott was a pop-art auteur. Many may roll their eyes at such a claim …I stand by it. 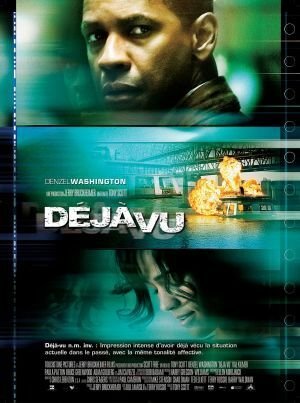 And Déjà Vu is one of my favorite science fiction films from the aughts, and amidst my Top 3 from Scott overall (2. Domino, 1. Revenge, both of which are tough sells in any discussion). The opening title sequence is visually/editorially clever as you described, but then so is the rest of the film in that respect; I’ve said before that it features one of the most inventive car chases ever committed to the medium. Good shout-out for Mr. Pink Hat. Bummer the video is blocked. I remember this movie though, and I quite like it. Interesting to see Jim Caviezel as the villain, pretty effectively I might add. I think this was after he played Jesus in the Passion of the Christ. The time-travel aspect was a bit confusing though, but overall I was entertained. Sorry to hear you had issues with the video, Ruth. Does this link work for you? Yeah, I thought Jim Caviezel as the villain was quite effective in the role. For a time after Passion of the Christ, he seemed to not to work much. As always, thanks again for the comment and share, my friend. Yeah, Caviezel is such an underrated and underused actor, he did say in interviews that he knew he wouldn’t get much work after The Passion was released. Speaking of which, that film is having a 10-year anniversary already. In any case, I haven’t seen Man of Fire yet, been meaning to see it for some time, hope to see that one soon. I was afraid of that. I guess I can see it cause I’m logged in to Google and uploaded the vid. Too bad. Wow, ten years? Still remember it so well like it was yesterday. It left quite an impact, for sure. BTW, I’ve changed out the video clip with a slideshow of the opening titles sequence. I’ve been pretty harsh on Tony Scott for his last couple of movies, I didn’t like Domino, Unstoppable or his remake of Taking of Pelham 1,2,3 but I really enjoyed Déjà Vu and you’re right, I really dig that opening scene. It may have been his last film that I truly enjoyed. He’s always been a favorite of mine until he started experimenting with crazy editing and over saturated color in his films. The climatic shootout in Domino gave me headaches and I couldn’t tell what the heck was going on in that scene. Good to hear from you on this subject, Ted. I think I remember you mentioning some of those. Certainly, Domino garnered much criticism when it was released. If you’re interested, you might peruse my colleague J.D.’s review of that film. It caused me to reappraise my initial reaction to it. I really enjoyed Unstoppable from the start, though. I’m inline with John Kenneth Muir on this film. Both articles probably won’t change your mind on either of them, but they’re worth reading. Especially concerning Tony Scott’s work overall. Glad to hear we’re on the same page with Deja Vu. I’ve seen it about four times now, and enjoy it more with each visit. I may fixate too much on Paula Patton. 😉 Thank you so much for this, my friend. It’s a shame he passed when he did. I thought he’d still have a few films up his sleeve. His glorious years were the 80’s and 90’s. I felt his efforts in the 2000’s were a little overshadowed by Michael Bay. Indeed. I think he was still producing on a high-level, and I always looked forward to whatever film he had coming up. I’d agree Michael Bay channeled a lot from Tony Scott’s work, and made the most of it. Maybe even more so, at the box office. Too bad. I enjoyed Mr. Scott’s work more. Thanks very much for the read and deft comment, Kevin. I actually really enjoyed this film, I think it even made my top 15 of the year it was released. I am glad you made a write up about this movie even though it has faded away from most of our memories by now. It’s a wonderful sci-fi/romantic thriller hybrid. Glad to hear you’re a fan of this Tony Scott film, mummbles. Thank you.